Black and white decor is so basic. But look what happens when one color is added to the mix. Personalizing black and white decor can be challenging and some find it cold. That’s because, by definition, it’s neutral and color free. To my eye, that keeps things edgy and always somewhat modern even when iconic ebonized pieces date from the mid-20th century. Perhaps that’s also why I was struck by the way essentially black and white decor was handled in the London townhouse of top UK designer Colin Radcliffe, who is known for luxe furnishings and a detailed eye that appeals to a deep pocketed client base. ElleDecor featured the house and naturally focused on the important furnishings, lavish use of black and white marble polished marble floors throughout, and the way a Georgian building was made to work for a young family. But I immediately fixed on something that went unmentioned: many of the rooms were pared down to black and white plus 1 impact color. That’s such a brilliant strategy and it offers amazing budget-wise possibilities, even in a tiny cottage. Take the dining room [top]. Marble floors set the stage with white walls. There’s a black and white 1940s Paolo Buffa cabinet, an imposing Maison Jansen 1950s brass and leather lamp in the corner, a 1960s Pierre Cardin mirror, 70’s acrylic coffee table, black and gray area rug and the color grabber — a Jacques Grange sofa upholstered in lemon-yellow Bruno Triplet velvet. Now, imagine this family room with a black leather sofa — instead of the emerald green. I think it would look so dull, no? Yes, the pair of black ‘70s Jansen lamps are lovely and the theme is consistent. 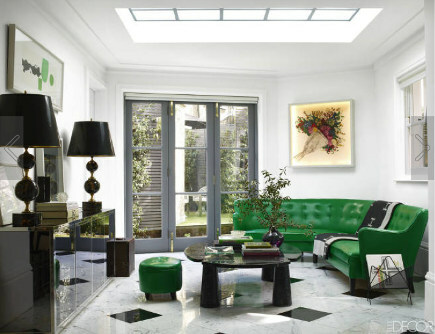 But the emerald green 1940s leather sofa makes this memorable. It’s so dominant I barely noticed the black and white Hermes throw thrown over of the sofa. 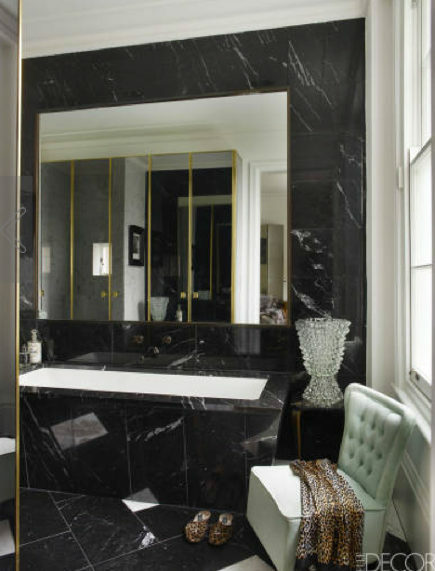 While both the family and dining rooms feature large-scale sofas in bright colors, the strategy is just as powerful in the predominately black marble bath. Again, it’s an upholstered piece and the watery blue is faded. But even a pastel can — and does — make the point.